In the Eastern Conference, things don’t change. 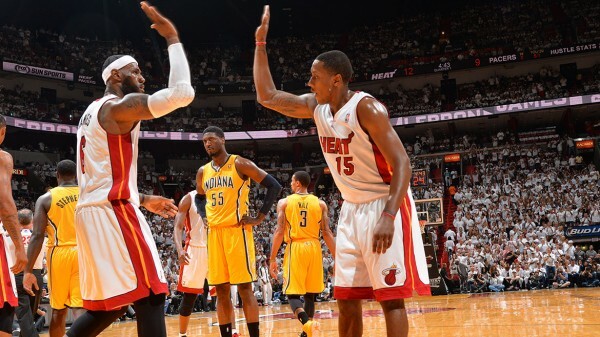 The Miami Heat meet the Indiana Pacers in the playoffs and knock them out, like clockwork. This time it took six games in the Eastern Conference Finals, with the defending NBA champions, led by LeBron James and Chris Bosh in a 117-92 humiliation, taking the series 4-2, not being disturbed by the basketball troll that Lance Stephenson has turned into. Like almost every game in this series, the Pacers took an early lead, 9-2 after almost five minutes. But some teams fold quickly. Their spine is weak, doesn’t bend. It breaks. They might act tough, but teams with heart don’t lose by more than 20 points in elimination games two years in a row against a team they’ve been built to build. The blame game can now begin – from Frank Vogel being a coach who can’t adjust, to Larry Bird making bad trades and not improving the bench. The players obviously don’t walk away without blame hurled at them. It doesn’t matter. Lance Stephenson said he spoke with Larry Bird and was put in his place. We didn’t see that actually work. The antics remained, only unfortunately for him, LeBron James didn’t get into any foul trouble. James finished with 25 points and 6 assists, attacking the basket and finishing with 9-for-9 from the line, sticking to easy shots as Roy Hibbert found himself far away from the basket and completely non-effective, as Chris Bosh scored 25 points as well. James scored 9 of his 15 points on drives with Stephenson guarding him. He got over the slap in the face, the intentional fall on him and other silly things Stephenson continued to do, which earned him a threat from the sidelines in the form of some explicit talk from Udonis Haslem. James said some words to Stephenson as well which was easy to understand, and it wasn’t PG-13. When it came to basketball, it didn’t matter – it wasn’t a fair fight. The Heat kept the Pacers on only four points through the final seven minutes of the first quarter. They kept that pace and defense in the second quarter as Rashard Lewis continues to look like the player who helped the Magic reach the NBA finals in 2009, and overall hitting 3-pointers without any remorse. The Heat finished with a 132.6 offensive rating, their highest ever in a game during the big three era, as their offensive efficiency continues to improve with every season. The “best” defense in the NBA couldn’t keep them out of the paint, getting 50 from close range, and finishing with 11 3-pointers, hitting 42.3% of their attempts. Paul George scored 29 points and hit five 3-pointers for a second consecutive game, but there wasn’t anything about the Pacers from mid-first quarter that suggested they have what it takes to fight the waves crashing down on them. George Hill and Roy Hibbert continue to fold every time there’s pressure on them, and for a team with no bench, it’s impossible to lose their two best players mentally and still find themselves in a winning position. The Heat won by 25, but they led by 36 points in the third quarter, and could have made this an historic loss if they just felt like it. Frank Vogel spoke after the game about the bitter feeling of disappointment, but tried to make his team look better than it was by talking about facing the Chicago Bulls and Michael Jordan of this era. Maybe he is right in a way, but there is no excuse to his team looking so bad with their backs against the wall. Not after they’ve led us to believe that this season it’s going to be different. It turns out winning the conference during the regular season doesn’t matter when you’re not that good of a team. And the Heat? They’ll be without home court advantage in the finals, playing against the team they beat in 2012 (which they prefer playing against) or against the one they faced in 2013. LeBron James is better against the Thunder. The Heat are better against the Thunder. But through these playoffs, we’re once again presented with the greatness of this team and its leaders, once again saving their best for when it matters the most, with that elusive three-peat one step closer.